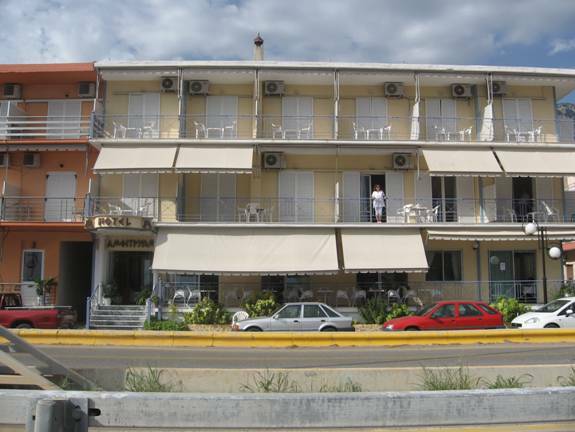 During our 2010 trip to Greece we needed to overnight in Agios Konstantinos, so we took the advice of our taxi driver friend from Athens, Spiros Halkides, and stayed at the Hotel Amfitrion (see photo to your right). It’s conveniently located just across the main road from the waterfront, and just a couple of blocks from where the Flying Cat and Flying Dolphin hydrofoils and car ferries depart for the Sporades islands (including Alonnisos). The Hotel Amfitrion features air conditioned rooms and televisions also are included. The nightly room rate typically includes breakfast, but in our case we chose not to take the meal. Our room was very basic but clean, and it included two single beds. If you prefer a queen size bed I would imagine they are available, but you’ll need to check with the hotel to verify that. 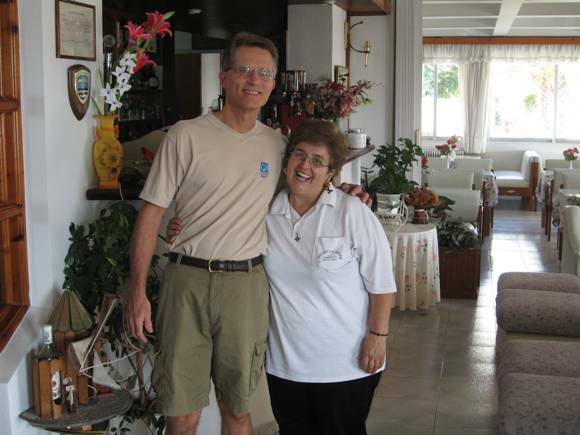 What I found most enjoyable about our stay was the hospitality (filo-xenia in Greek) offered by the owner Katerina (see photo of us on the left). From the moment we arrived she was exceptionally friendly and quite obviously very grateful to have us as her guests, even though her English is only so-so (you could easily see it in her eyes). Because of her kindness we’ll be certain to stay at the Hotel Amfitrion again the next time we need to remain in Agios overnight. To book a room there via telephone call 30-22350-31702 or 30-22350-31285. Also, here’s a link to a page about the hotel on Booking.com. As a final subject, the night we stayed in Agios we ate dinner at a restaurant called To Taverna to Parko that had very good food at reasonable prices. It’s located just across the park from the town church. For a map of the Agios waterfront, click here.